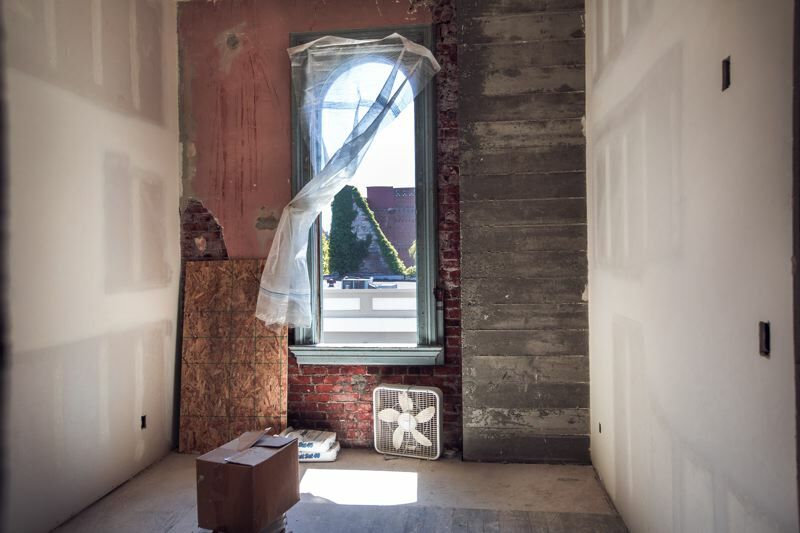 With the City's drafted policy on unreinforced masonry buildings (URMs) making its way through workshops toward the City Council, some URM owners are getting ahead and starting the process of their seismic retrofits. The policy, still in draft form, would require old brick-and-mortar buildings to be seismically retrofitted — braced with steel to reduce the effects of ground liquefaction during a moderate earth quake. This covers most buildings built between 1870 to 1960 — about 1,800 total within the city. The intent is to reduce risk to human life and doesn't guarantee buildings can be occupied afterward, but aims for the buildings to be quickly reoccupied, adding to Portland's resiliency. Of the total 1,884 URMs formerly pinpointed in Portland, only 4.6 percent (87) were fully upgraded, 8.5 percent were partially upgraded, and 8 percent (153) were demolished under the current code. An estimated 85 percent of existing URMs have had no retrofits at all. The remaining nearly 1,800 buildings include 45 schools, 35 churches and 270 multi-family structures with 6,000 units. About 400 URMs are on the National Register of Historic Places or are located in a designated National Historic District. The Business Tribune checked in with Walter McMonies, owner of the Trinity Place Apartments, and Matt Siegel, owner of the Society Hotel, about what seismically retrofitting their URMs entailed. Walter McMonies, attorney at Lane Powell, owns multiple URMs and is a volunteer on the URM policy committee that is developing the draft. McMonies is wrapping up the years-long process of retrofitting the Trinity Place Apartments, built in 1910 and located at 117 N.W. Trinity Pl. near Providence Park. "It has all the deficiencies of most unreinforced masonry building and a couple things that were good about it that helped us," McMonies said. "We had very strong floor diaphragms, which is something you have to upgrade normally, so that saved us a lot of money." The way URMs are generally built, the floor joists sit in nodes on the walls. Because this type of floor is only attached by the edges, it will pancake if an earthquake hits. Floor diaphragms act like beams underneath, holding up the floor's middle. "My Trinity Place project was very advantaged: floor diaphragms were already stiff, (and we) could do floor joist tie-ins on unit turnover," McMonies said. "(We) could do vertical boring to strengthen the exterior walls and didn't need to vacate the building, so there was no substantial loss of cash flow." He had to cut a hole in the roof of every unit, every four feet along the edges to tie the floor joints to the exterior walls. 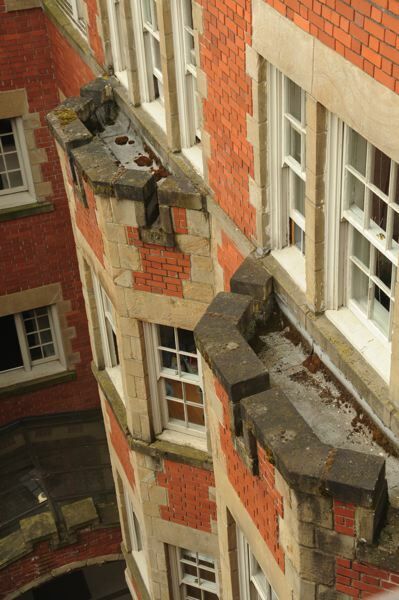 He also had to tie down the parapet walls and secure the columns of bay windows. The biggest, longest part of the job is also the most cutting-edge: drilling holes in the walls from top to bottom to strengthen them. That's where the moment frames were installed to reinforce the walls on the interior. The aged bricks weren't systematic — some were a little low, a little high and not flush — creating difficulties in the retrofit. "All units were occupied at the time. In the middle of the day most tenants weren't around, but we had some instances where bricks were flying around a unit when people were in there," McMonies said. "We knew something wasn't exactly plumb and we have to vacate the unit. Once it happened one time, we were pretty wise about it." Matt Siegel, co-owner of The Society Hotel in Chinatown, also owns Building Blocks, LLC, the design-build company that organized the hotel's recent renovation along with Integrate Architecture. "We did a full seismic retrofit of the building ... we brought it up to the highest standards," Siegel said. "Really from the ground up it had no foundation to speak of, it was built on rubble." Siegel's team started underground with a massive footing, installed a large moment frame on the front half of the building, added eight-inch thick walls to two corners and tied everything into a central elevator shaft that sits on a 20x20 footing extending up to the roof. "(We) more than doubled the amount of framing in the building and only lost about 125 square feet of spate," Siegel said. "That was something we were really proud of and our architect and engineer did a really wonderful job in creating the plan for us that was very difficult to execute, but we were really happy with the results because it did not detract from the overall historic aesthetic of the building." Siegel said they ran across surprises while the building was under construction. "One of the most notable was a passive air conditioning system that was hidden in the walls," Siegel said. "There was a 2.5 foot gap in between the layers of brick and the exterior walls that extended from the second floor up to the fourth floor." Shear walls, or a structural system composed of braced panels, are designed to carry wind and seismic loads. "The other real challenge was supporting the existing floors and all the framing for the floors while taking away their connection to the exterior walls," Siegel said. "We had to support them, cut them away from the walls so we could pour out shear walls and reconnect them to our shear walls as we went up." "It's a classic unfunded mandate," McMonies said. "The City is saying, and I agree, these should be retrofitted and saved — I love old buildings for one thing — but there isn't the money there to do it." McMonies said in general, people updating URM building will spend 40 percent of the renovation budget on seismic retrofitting. "We weren't doing anything but seismic upgrades, the building is in pretty good shape," McMonies said. "(We spent) $1.3 million — that's extremely a bargain, maybe half as much as it will cost somebody else who for instance doesn't have the floor diaphragms," he said of the Trinity Apartments. He said his building's retrofit would have cost closer to $2 million if he'd had to upgrade the floors. 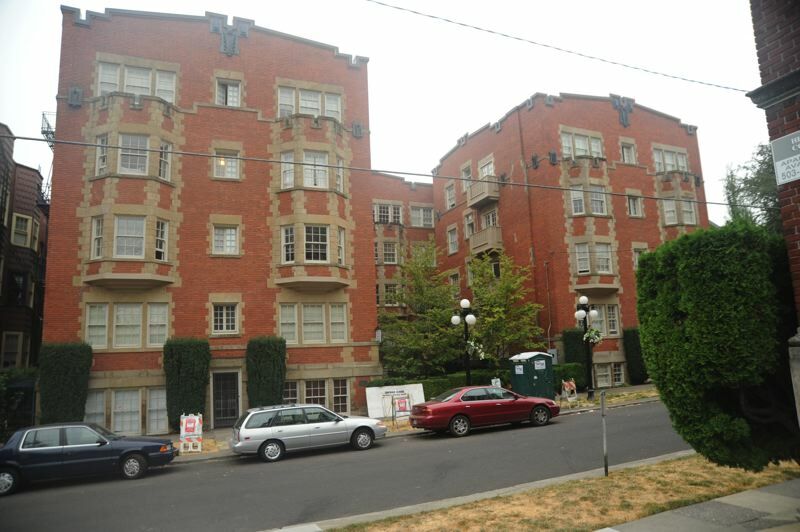 "I really came through this amazingly well because of my floor diaphragms and ability to do unit turnovers, and seismically tie it together without evicting all of my tenants," McMonies said. "We're talking a huge amount of money: a rich person might have trouble coming up with that." The City's estimate for average retrofits is near $68 per square foot, which would have penciled out to a total of $3.128 million for McMonies's 46,000 square foot building. "$68 a foot is prohibitively costly for an owner, even one with a large portfolio, so the City must help financially with a State Tax Credit or State Tax Abatement — 10 years of no property tax," McMonies said. "(As an) unfunded mandate, requirements but no help achieving them will force some owners to demolish or convert their project to condos." 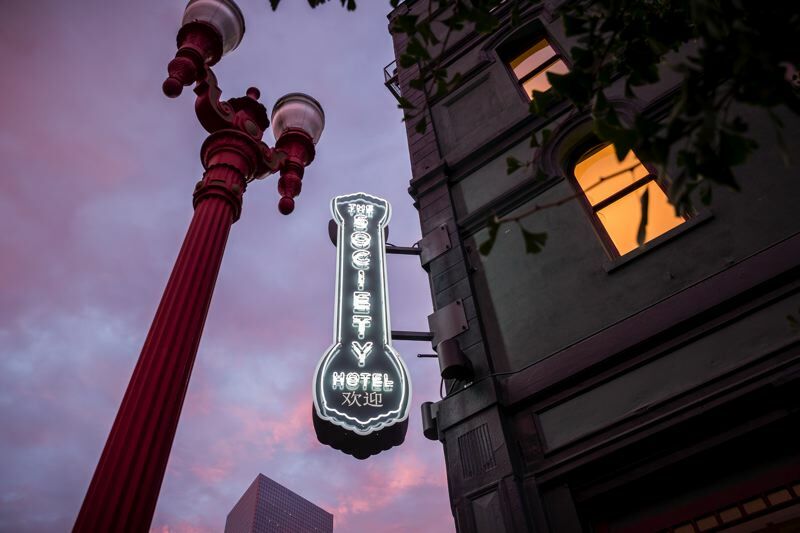 As for The Society Hotel, Siegel's total construction budget was $2.8 million, spending around $500,000-600,000 on seismic retrofitting — that's doing all the work themselves through his own company, Building Blocks. "Without that, I think it would be impossible for us to afford, and I'd imagine it would be impossible for other developers," Siegel said. "It just happened to work out that our business model supported this, and because of our historic tax credit we were able to make it a wash."
retrofitting, exclusively available to National Register historic buildings: the State Property Tax Assessment freeze (currently 10 years with a 10 year extension), and the Federal Income Tax Rehabilitation Credit, which returns 20 percent of approved expenditures if the project cost is higher than the taxpayer's tax basis in the property. The Trinity Place Apartments are listed on the national register of historic buildings, which makes it a little easier to upgrade in a roundabout way. "Trinity had the advantage of having a fairly low tax assessed value and renewal for another 10 years," McMonies said. "That was a big help for us, paying lower property taxes than we would have otherwise." If you exceed your tax basis on the building, you can apply for approval of a 20 percent tax credit. If you spend $1 million renovating the building, you get $200,000 back in federal tax savings. "Those two benefits did help us quite a bit," McMonies said. "We haven't yet got the tax credit — we haven't finished the job." The City does have limited funds available for buildings located in the Chinatown and Skidmore urban renewal areas, where the Society Hotel is located. "Because we were going for recognition by the federal historic tax credit, we really wanted to have everything appear as it would have 130 years ago when the building was built, so even in pouring the new shear walls we used a method called board formed concrete work," Siegel said. "So instead of big modern panels that would obviously look like modern forms, we used two-by-six and two-by-eight horizontal, just as they would have done 135 years ago." Siegel said in working closely with the City, the team has a loan through the Portland Development Commission (PDC) for $750,000, but it wasn't to do with the seismic retrofit. "We didn't get any help from the City for the seismic upgrades," Siegel said. "I think that's what people are really looking to the City for now, and the talk of the City providing some assistance with these URM buildings really started in earnest while we were already underway, so we did not get any help specifically for the seismic (retrofit)."